This root vegetable is not only from the celery family, but also has a similar taste to celery, as well as a hint of parsley. It can be mashed, used in soup or eaten raw in salads. A cream of celeriac soup served with a crispy sage leaf beurre noisette garnish. 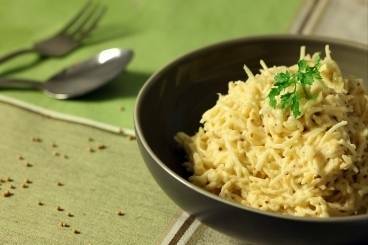 Finely grated celeriac with wholegrain mustard and homemade mayonnaise finished with parsley. 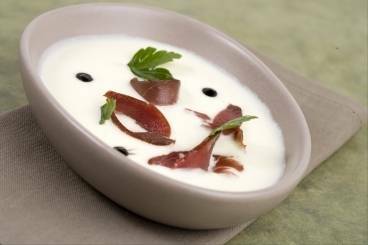 A creamy celeriac soup served with smoked duck breast and reduced balsamic vinegar. A cream of celeriac soup served with seasonal wild garlic. A rich and warming winter broth with a ruby red colour. Peppery watercress, spinach and celeriac soup served with a cheddar cheese crouton. Lamb neck fillet served with creamy celeriac puree, honey glazed salsify, buttered green beans and a mint and parsley sauce.